This Event Expired on August 15, 2009. If you are the coordinator for this event please login to edit your show dates and information. If you do not yet have an OldRide Membership, please create a free membership then login to this page and submit the 'Request to Manage' form. Premiere Props will be auctioning off iconic cars from fan favorite movies for one weekend only! 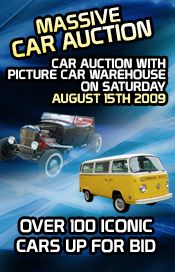 In partnership with Ted Moser of Picture Car Warehouse, Premiere Props will be auctioning off over 100 iconic cars from acclaimed Hollywood movies as well as hot rods and classic cars from Picture Car Warehouse's collection on August 15th at Premiere Props' warehouse in El Segundo, California (128 Sierra Street, El Segundo, CA 90245) at 11am with a preview from 9am - 11am. Premiere Props and Picture Car Warehouse will auction off one-of-a-kind automobiles from box office hit films including "Little Miss Sunshine," "Unthinkable," "Indiana Jones," "The Great Debaters," "Redline," "Slipstream," "Knight Rider," "Sand Boys," "Soul Men," "No Country For Old Men," "Holiday," "Bruce Almighty," "Fast and Furious," "Rush Hour 3," "Mad Men," "Taxi," and many, many more!